Rapid cost declines in renewable energy technologies made them the cheapest available sources of new electricity, even without subsidies, in 2017. And in many locations across America, building new wind energy projects is cheaper than running existing coal-fired power plants. This dynamic is apparent in the 27 coal plant closures announced by utilities in 2017, totaling 22 gigawatts (GW) of capacity, capping a decade where nearly all power plants retired since 2008 (including 50 GW of coal) were powered by fossil fuels. The U.S. Energy Information Administration forecasts coal closures will continue through 2020 and could set an all-time annual record in 2018. 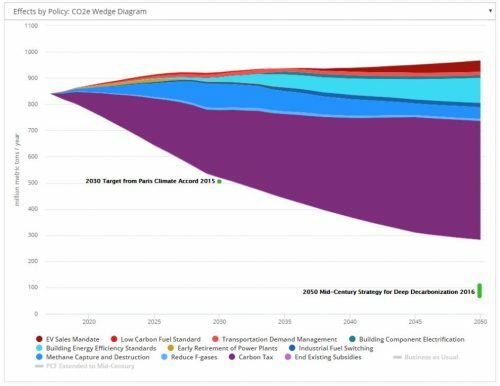 Despite the Trump Administration’s rhetoric and policy proposals to boost fossil fuel economics, updated levelized cost of energy (LCOE) data and forecasts from international energy analysts show that renewable energy costs keep falling, continuing to pushing fossil fuels further from profitability. 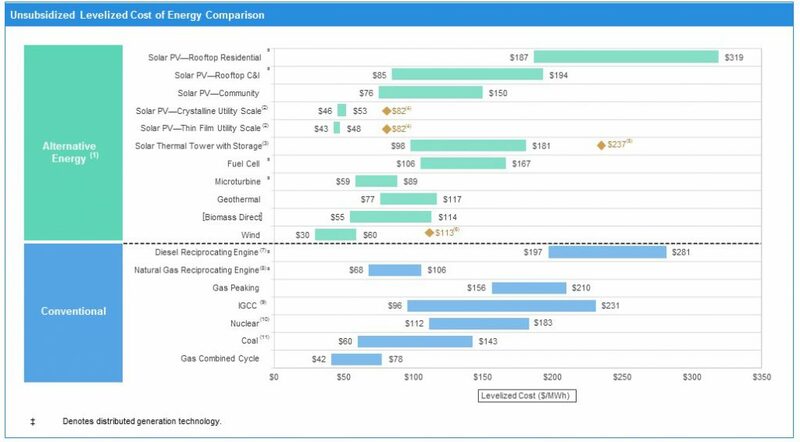 The 2017 edition of Lazard’s annual Levelized Cost of Electricity (LCOE) study shows unsubsidized onshore wind and utility-scale solar are both cheaper than new coal in many parts of the U.S., and are cost-competitive with new combined-cycle natural gas on a levelized cost basis. 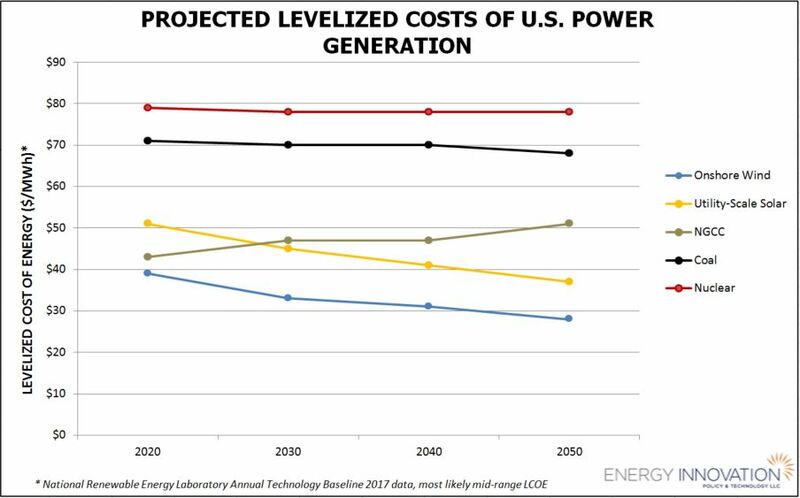 LCOE accurately compares the economics of different generation technologies by measuring the total cost of first building a power plant, then operating it over its assumed lifetime. Think of it as evenly comparing apples to oranges. 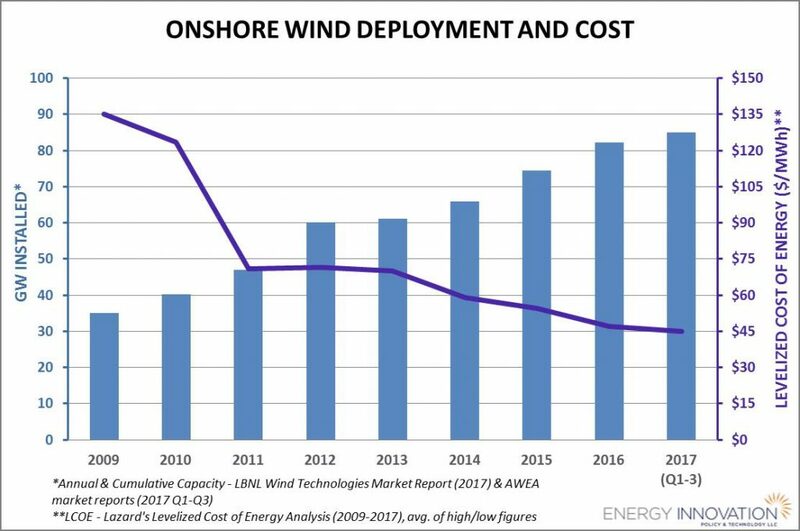 As the LCOE of renewable energy continues to decline (dramatically, in the case of utility-scale solar photovoltaics) building new wind and solar costs less than simply continuing to operate existing coal plants. 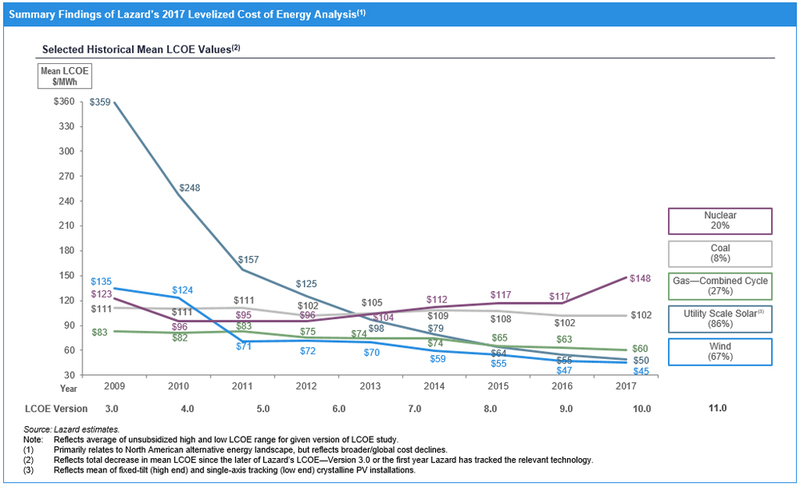 Lazard reports the mean subsidized LCOE for utility-scale solar fell 72% from $178 per megawatt-hour (MWh) in 2009 to $50/MWh in 2017, while the mean LCOE for wind energy fell 47% from $85/MWh to $45/MWh over the same time span. These declines outstripped the cost trends for natural gas-combined cycle (down 27%), coal (down 8%), and nuclear (up 20%) from 2009 to 2017. 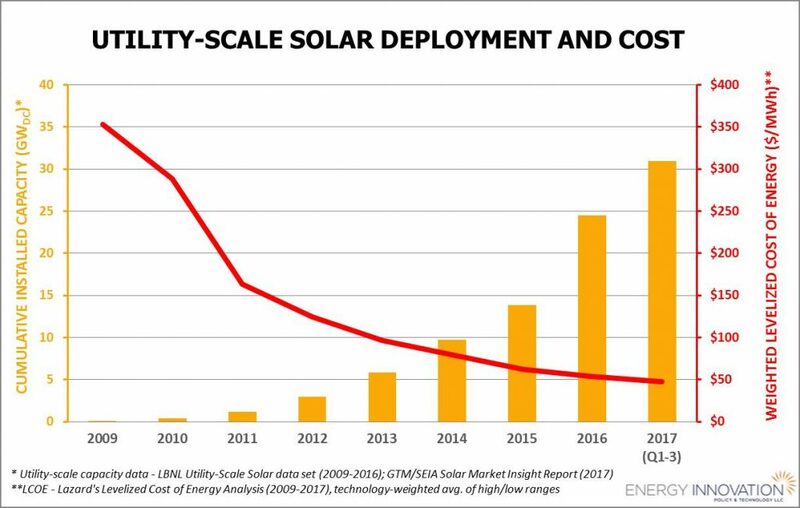 The changing cost dynamic between renewable energy and fossil fuel is underpinning surging wind and solar installations across the U.S. As the weighted LCOE for utility-scale solar fell from more than $350/MWh in 2009 to less than $50/MWh in 2017, cumulative installations rose from 1 GW in 2009 to more than 30 GW cumulative installed capacity in the third quarter of 2017. Onshore wind is even cheaper than solar, with nearly triple the installations. The weighted LCOE for wind energy declined from around $135/MWh in 2009 to less than $45/MWh in 2017. Cumulative onshore wind installations rose from around 35 GW installed capacity in 2009 to more than 85 GW installed capacity in the third quarter of 2017. These cheaper costs could double installed U.S. renewable energy capacity by 2020. The Federal Energy Regulatory Commission’s most recent Energy Infrastructure Update expects 116 GW of proposed utility-scale solar and wind net additions to come online by December 2020, roughly twice the current total installed generation capacity of 115.5 GW. 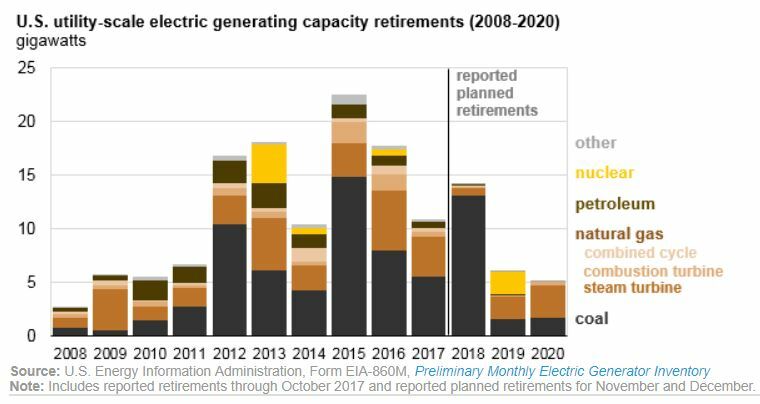 Wind would add 72.5 GW (with only 68 MW of retirements) while utility-scale solar would add 43.5 GW new capacity (with just 2 MW of retirements). When other renewables like hydropower and geothermal are added to the tally, total renewable energy generation could make up 26.5% of total U.S. generation capacity in 2020, up from 19.9% today – and solar and wind would combine to equal 16.7% of total capacity. Of note, FERC does not count distributed solar (i.e. rooftop solar) generation in this tally, meaning solar energy’s total contribution could be much higher. U.S. grid operators are already integrating higher penetrations of wind and solar energy without risking reliable power supplies, but fully capitalizing on cheaper renewable energy relies on regulators and utilities collaborating on three important policy actions. First, ensure wholesale market design properly values grid flexibility and supports the renewables transition by accurately valuing distribute generation. Second, expand strategies to help utilities retire older generation that is no longer profitable while dedicating funds to assist communities affected by closures. Third, align the financial incentives of utilities with the outcomes consumers want to deliver value through performance-based regulation.